Children love to dress-up and develop their imaginative ideas through open-ended role play. They imitate the people around them and enjoy recreating scenes from their everyday life. Role play feeds the imagination, builds confidence and provides creative contexts for social communication. Children can identify with the characters they come across and explore how to engage in story and drama. This role play resource collection will build on from provision in the EYFS, provide a core set of resources that will enable children to set their own contexts, whether it be real life or fantasy. They can open shops, vets or police stations, have tea parties or put on the most amazing performance. The opportunities for language development are endless. 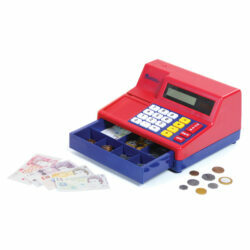 Cash register – 26cm x 24cm – Children can practice early maths skill whilst playing shop with this cash register. Featuring a solar-powered calculator, oversized buttons and a large digital display, this resource is easy to use. Includes pretend credit card and UK play money. Pet Carrier and Dog – 32 x 25 x 30cm – This lovely wicker carrier with pet bed could be taking your puppy on holiday or for a check-up to vets. Dachshund puppy included. Police Tabard & Hat – This tabard and hat will inspire great imagination, enabling children to feel confident as they become officers of the law! 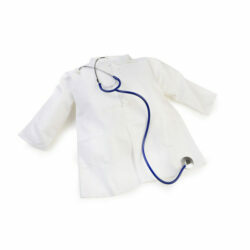 Doctors Coat with Stethoscope – This white doctor’s coat will make children feel the part. A stethoscope completes the look. 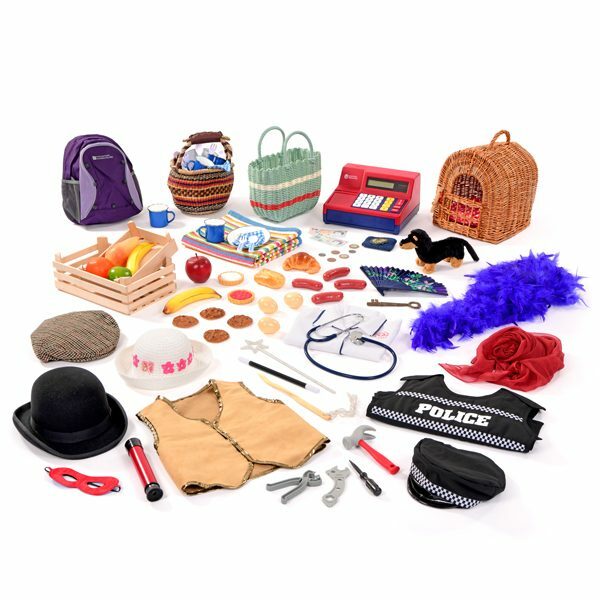 This open-ended resource can be used to represent any medical professional such as dentist or scientist enabling children to use their imagination as they play dress up. Wicker Basket and Fruit – Natural, patterned shopping bag with handles and some recognisable fruit items from the everyday trip to the grocers including bananas, apples, oranges and pears. Woven Basket & Purse Set – A bright woven shopping basket and coloured purse are just right for a day at the shops! 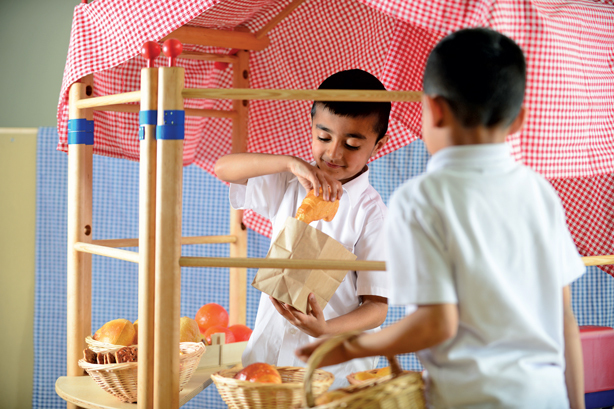 Set of Grocery Crates – Children may set up their own grocers, or bakers perhaps and explore the role of shopkeepers. Set of Hats – Including a flat cap, bowler hat and colourful flower summer hat. A hat can simply turn a child into a story character from another place and time. From a farmer to a magician or even a trip to the seaside, children will love becoming characters of their choice. Set of Food – Including bread rolls, eggs, sausages, tarts and cookies, children will have all the food they need for a picnic in the park. Set of Wands – Whether a magician, a wizard or a fairy, here’s a wand to suit every tale. Feather Boa – This bright and colourful purple feather boa is the perfect addition to any role play area. Children will love dressing up as a glamorous actress or perhaps a famous performer. 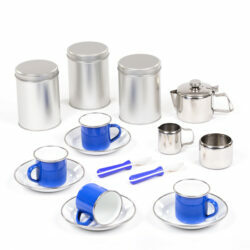 Set of Cups and Saucers – This set of four cups and saucers include blue check napkins and cutlery for your trip to the park or picnic. Set of Tools – Including a hammer, screwdriver, pliers and a wrench, children can become Builders, Plummer’s or handymen with these favourite tool accessories. Superhero mask – this reversible superhero mask with red and blue sides enables children to become their favourite superheroes and save the day. Rainbow Striped Rug – 60 x 90cm – This rug can be used as a setting for a house, a blanket for a picnic or a pretend flying carpet. Chiffon Fabric – Children can drape this large piece of fabric round them as a cape, a scarf or even twist into a turban – the possibilities are endless. Rucksack – 29.5 x 23.5 x 14 cm – This small durable, lightweight rucksack is perfect for daytrips and walks. The bag has multiple pockets for storage so children can fit all the accessories they require for a camping trip or hike. Brown Waistcoat – This brown waistcoat and gold trim is open-ended in terms of the many characters it could represent. From a magician to a wedding waistcoat or even a cowboy, children will love dressing up into a character of their choice. Set of Role Play Accessories – Telescope, floral fan and large iron key.